Our cane coffins are an attractive light buff colour and available in traditional or rounded end shapes. This lovely coffin can be used as part of funeral arrangements in Manchester or will cost £520 including delivery to other areas of the UK. Cane coffins are certified by the Funeral Furnishing Manufacturer’s Association (FFMA) for quality, strength and suitability for purpose. Cane is very environmentally friendly due to the fact that it grows rapidly, as much a 6 metres a year. Cane grows in degraded forests and in marginal soil, in areas where other land products cannot grow, for example areas that remain flooded for long lengths of time. Cane clings to tropical rainforest trees and so actively supports the preservation of trees in the rainforest. It can be introduced artificially in natural forests without disturbing the existing natural eco system. It provides income to some of the poorest people living in and on the fringes of the rainforests. All our eco-coffins are suitable for traditional, green burial or green cremation. Other natural coffins available are crafted from; bamboo, banana leaf, cardboard, willow/wicker, pandanus, seagrass, and wool. 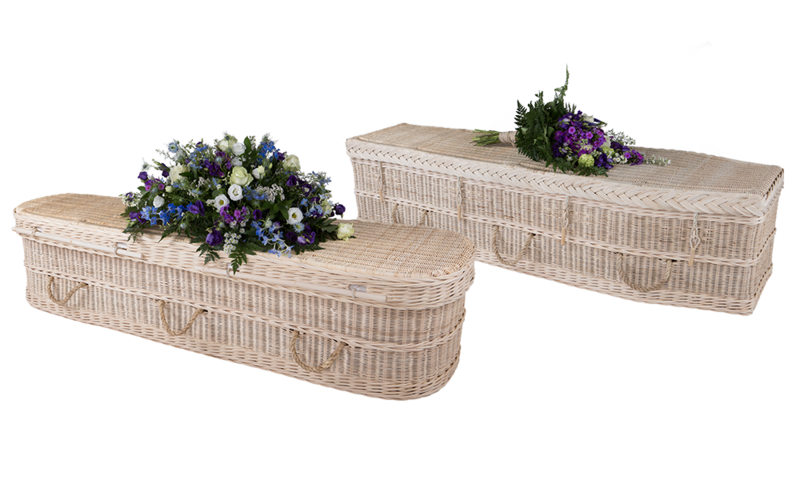 We can sell an individual cane coffin with delivery for £520.